The British Humanist Association have organised a free conference on Wednesday June the 16th to help Relgious Education teachers in the UK who want may wish to learn more about humanism and give them advice on how they can include non-religious perspectives in their RE lessons. I can't remember exactly when the photograph was taken, but think it was at a National Federation of Atheist, Humanist and Secularist Student Societies (AHS) event a few years back. 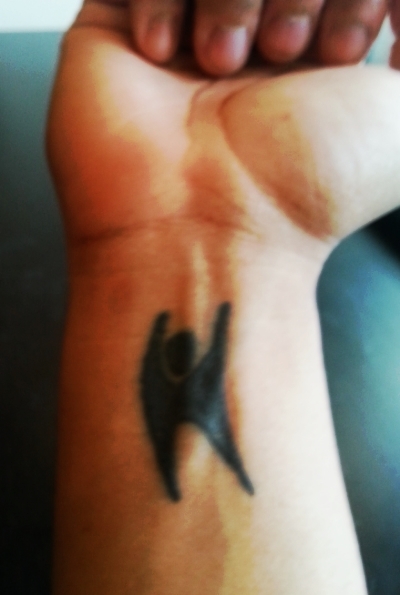 It's funny that they chose the tattoo on my left wrist and not the one on the right wrist, which is a little more obviously humanist. Whilst it's cool that a photograph of my rubbery, Bo'Selecta-looking face was chosen (and I am a little proud), I wanted to write a few words about just how important this event is, and what it signifies in terms raising awareness of humanism and ensuring that non-religous views are discussed appropriately alongside relgious ones in school, particularly in light of how I’ve seen things work in Norway. When I was at primary and secondary school (mid-80s to 2001) I don't remember studying or discussing anything but the major religions (Christianity, Hinduism and Islam), with a smattering of Buddhism and Judaism. That’s not to say, of course that we didn’t cover atheism/humanism/non-belief – we just didn’t cover it in any way that had any meaningful impact. That people didn’t believe in God wasn’t on my radar at all (especially as I was raised in a nomainaly Hindu household). As I've written about before and turned into a Prezi, I didn't even know Humanism was a thing until my girlfriend introduced me to it in my first year at university. Fulfilling each of aims, particularly the second one, which is only one of three instances in the guidelines where non-religion is mentioned (compared to 14 for Christianity), requires that pupils are exposed to, taught and discuss non-religious views. I recently asked two of my cousins (aged 11 and 13) who live in the UK (Leicester to be precise) about whether they talked about the idea that some people didn’t believe in god in RE class and they said ‘not really’. Religious Education seems, perhaps obviously, to still be predominantly about religions. One of the things I like in Norway is that the school subject is called Religion, Lifestance and Ethics (RLE) (although not for much longer if Norway’s minority coalition party, the Christian Democratic Party, have their way and turn back the clock so that it becomes 'Christianty, Religion, Lifestance and Ethics'). RLE fully captures the richness of the subject and is a much more inclusive name. I know that things should be taken one step at a time and just getting teachers to be confident about including more non-religious philosophy into the curriculum would be an achievement, but I’d fully back a campaign to rename the subject to something similar in the UK, too. Judging by some of the reaction to the BHA successfully getting a copy of Alom Shaha’s Young Atheist's Handbook into every school library, not everyone, is keen on children being exposed to ideas that might genuinely encourage “challenging questions about the meaning and purpose of life, beliefs, the self, issues of right and wrong, and what it means to be human”. As good as Alom’s Shahas’ book is, I don’t think anyone is seriously comparing it to the Bible (although, by my reckoning, it does contain more humanity and understanding of human experience). The religious picture in the UK is changing and changing pretty quickly - it’s important that Religious Education in schools reflects this. In the face of reactions like the one above, and how genuinely difficult it must to be talk about non-belief if you’re a teacher in a classroom where the majority of the children have had a religious upbringing (as my cousins are), the importance of this conference cannot be overemphasised.